Who is Shri Mataji ? I started practising sahaja yoga meditation seven years bac in Haridwar, India. Actually my mother started Sahaja Yoga meditation first and she would always tell me to meditate. During that time I had just finished my high school and was enjoying and having great fun with my friends. I was very carefree in my life and would not listen anything about sahaj yoga. Once my mother took me for meditation to the Sahaja Yoga center. There I tried to meditate but I did not feel any difference because I thought that this is not the age for all these things. Also I had many doubts about these things like how we can get the thoughtless ness in front of a picture . 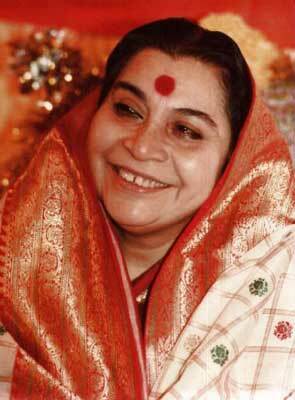 I opened my eyes and saw Shri Mataji's picture I felt I am very secure in front of Her. Tears started rolling from my eyes. After that I felt very light also I felt as if I got the answer to all my questions. All my doubts went away with my tears, I felt the cool breeze on my palms and my head which is the proof that my kundalini got awakened effortlessly and spontaneously. Really, Sahaj Yoga is the only way to experience this joy. Actually through external means what we get is just happiness or pleasure but what we get through Sahaja Yoga meditation is pure Joy. I am married with Shiva selected by Shri Mataji for me. I am very happy with my husband. We are recently blessed by a son. We do meditation and also atend the weekly meetings of sahaja yoga. It help us to enjoy a balanced and peaceful life. We are very thankful to Shri Mata ji for all the blessing which She gave to all of us.